I came across some fun pictures in a hundred-year-old magazine of a wedding cake and a tablescape idea for a spring wedding. Enjoy! Help, which fork do I use??! I think you use them from the outside in, so at the end of each course, you lose a fork. It sure was. Some things were so much more formal back then. This was fun. Wonder who made cakes inspired by that article and what happened to the newly married couples. I like how the caption on these old pictures indicates who designed the cake and tablescape. It shows a certain respect for those talented individuals. How true. I wonder how large the typical wedding was a hundred years ago. My first question was, “What is gum paste?” Well, as it turns out, gum paste is a form of sugary dough used to decorate things like wedding cakes — and it’s still around. You can buy it at places like Walmart, or make your own. Who knew? The articles I read were very clear, though: gum paste is not fondant! Interesting. . . Thanks for researching this. Until I read your comment, I’d just assumed that it was some type of fondant. Wow, that cake looks really complicated! Love how festive their tables always were. The attention to detail is quite beautiful. I think this is so interesting! Thanks for asking. The menu was included in the magazine article. Your comment made me realize that I should have included it in the post. Here it is: strawberry cup, wafers, rolls, lettuce cream soup, olives, radishes, eggs in aspic jelly, broiled chicken, potato balls, asparagus salad, pistachio and fresh coconut ice cream, wedding cake, candies, salted nuts, coffee. No recipes are included–though I’m curious about a few of the dishes, especially the lettuce cream soup. It must have been quite the event. In 1916, Ladies Home Journal was already a mass circulation magazine magazine. 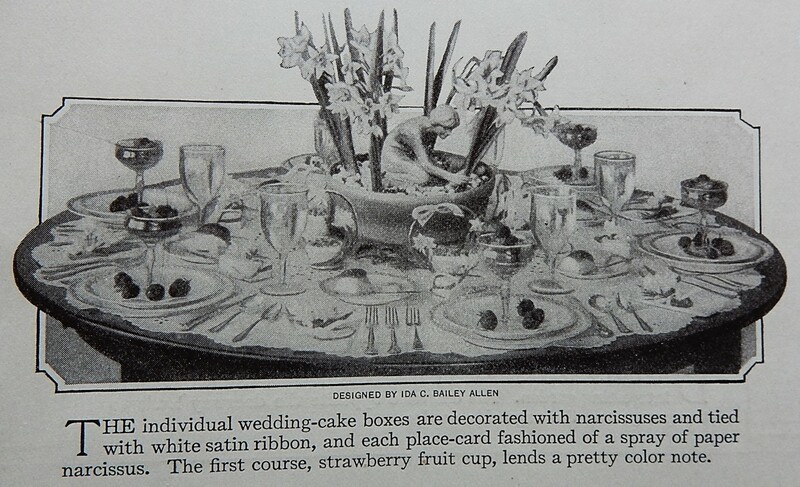 I’m thinking that this tablescape and wedding spread may have been aspirational for many readers, and not typical. That is quite a menu, though in most part the dishes are quite simple, it definitely was labor intensive. I too think that it was not typical and more of an aspiration. As for the lettuce soup – it was quite common in classic French cuisine. It’s interesting that it somehow lost popularity. I wonder why. I still use it in certain soups. It adds lots of body and creaminess without making the soup heavy. Thank you for posting — this sounds delish, and I have been hungry for a “new” soup! I enjoyed learning a little about the history of lettuce soup. It sounds like it’s time to reverse the trend, and revive the use of lettuce in soups. Thanks for sharing the link. This soup looks wonderful. Charming setting and a very interesting menu. The ice cream would be delicious. I think that you’ll like it. If you make it, let me know how it turns out. With these old recipes, it’s always helpful to get the opinions of others about any tweaking that may be needed. It’s interesting how styles change across the years – even for wedding cakes. 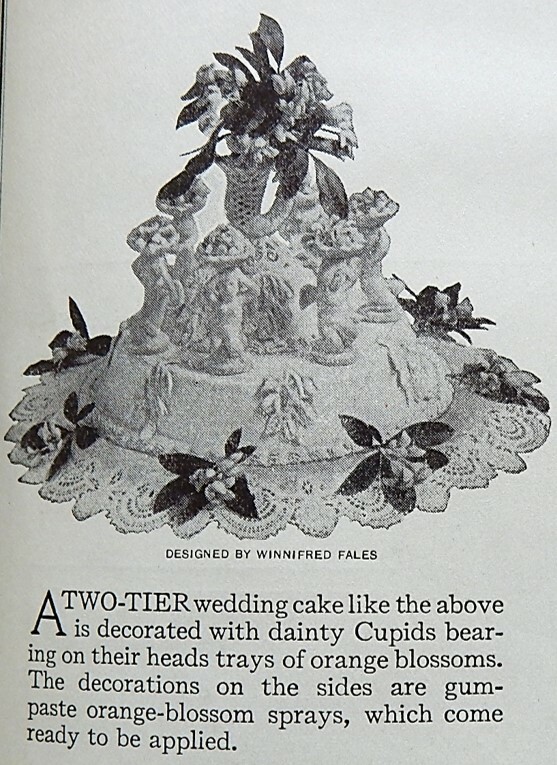 For example, bride and groom figurines on top of the cake were popular once upon a time. And, wedding cakes with plastic pillars between the layers were very popular when I got married. Me too! I still think the cake(s) should be rich fruit cakes, but I gather they’re no longer in vogue. Thanks, it’s nice to hear that you liked this post. Oh this is so lovely. I wonder if it was just for a small family gathering…as you say, perhaps is was their Martha Stewart edition 🙂 And the narcissus would smell heavenly! Mine are just finished here in PA.
You may be right that it was for a small family gathering. I love how you describe the smell of the narcissus on the table. I’m not a fan of cupids, but I still think both the cake and the table setting are rather pretty! I tend to associate cupids with Valentine’s Day. Apparently a hundred years ago, cupids represented something broader (love) than just a holiday. Lovely cake and table setting! Thank you! It’s wonderful to hear that you especially enjoyed this post. It is a bygone era … although I have seen elaborate cakes at some weddings I have been to. So great! I love seeing how the tables were set, and the pretty little details. Wish I could have attended this wedding! One of my grandmothers got married in 1910 and one in 1919. I would love to time travel back to either. Pretty sure neither had anything like what is pictured. Have a lovely Sunday, and best wishes from Paris, Sabine. They look lovely. I appreciated how the person writing the caption mentioned colors (“white satin” and the “strawberry… color note”). I’m going to imagine the narcissus is yellow, but it might be white or other colors (I have no idea how long those colorful varieties–like pink–have been around). My niece is getting married soon. She will enjoy this post. My blog got accidentally deleted. I am so happy to be back. I have missed your posts! I’ve missed you, too. Welcome back! It’s so interesting to see how far cake decorating has come. It’s fascinating how styles and decorating techniques have changed across the years.